The new Kirby game came out last Friday. It’s called Kirby: Triple Deluxe. When the title was first announced, I thought that maybe that meant it would be a sequel to Kirby Super Star, as that game was called Kirby Super Deluxe in Japan. Upon further contemplation, I realized that it’s just a hackneyed way of calling it Kirby 3D without actually calling it Kirby 3D. Bravo, Nintendo. While it’s not a Super Star sequel, Kirby 3D is still pretty much exactly what one would want from a Kirby game. It’s adorable, the powers are a lot of fun to play with, and the bosses are elaborate and interesting. Much to my surprise, the soundtrack is terrific. I don’t know why I was so surprised by that though. Maybe because of the depressingly disappointing soundtrack in Yoshi’s New Island. Anyway, It’s Kirby through and through. If you’ve played a [regular] Kirby game, you’ve played this. It’s a fun romp through a bunch of levels where you get to eat guys and wear fun hats. The new Hypernova ability is a lot of fun, but that’s not what really got to me. For the first time ever, I’ve been totally won over by the included mini-games. Or, as the Kirby series likes to call them, sub-games. And really, that is a better moniker, because these extra games are anything but mini. The first, and the most immediately attractive, is Kirby Fighters. 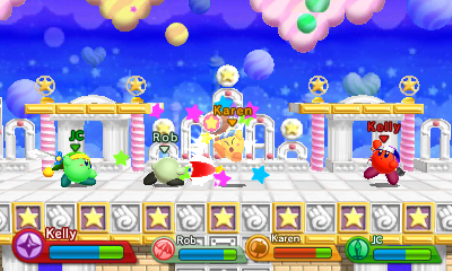 It’s multiplayer, and up to four players can choose a permanent Kirby ability, then duke it out. It’s a little bit like a tiny version of Smash Bros, but it still plays like Kirby. If that’s not immediately clear, what I mean is that the Kirbys move just like they do in the main game. There aren’t any special fighting game physics or nuances added for this mode. I stress this point because for some reason my mind expects Kirby to control the way he does in Smash Bros, but he doesn’t, and it’s a little weird at first. But still, it’s plenty of fun, and the abilities seem to be fairly balanced. I haven’t actually played Kirby Fighters with another person yet, but I imagine that it’s got to be a good time, because the single-player mode is a lot of fun. If you play alone, there’s a fun little arcade mode where you play a sequence of seven fights against CPU players. There’s a training mode where you can set up a custom match and pound on CPU Kirbys, which is pretty much the equivalent of the multiplayer experience. With four difficulty levels and nice set of arenas that draw from past Kirby games, there’s a lot here to like. The only thing that makes me sad about Kirby Fighters is that you only get to choose from ten abilities: Sword, Hammer, Cutter, Parasol, Archer, Ninja, Beam, Whip, Fighter, and Bomb. There are 25 abilities in the main game, and while some are cut for obvious reasons (Crash, Mike, Sleep), I cannot fathom why others (Bell, Leaf, and Spear) aren’t included. Or Wing! My beloved Wing ability got cut and I demand to know why! Heck, the new Circus power is perfectly suited for this sub-game, but it’s curiously absent, too. What would be nice is if in the next Kirby game, there was a bigger, fuller version of Kirby Fighters. Let all of the abilities have their chance to shine, whether they’re viable contenders or not. I’m sure someone out there would be pleased as punch to try to eke out a victory with Wheel or Stone. They should even put in the cooler powers that were only in one or two games, like Mirror and Animal. I would absolutely go to town in a Kirby Fighters where I could rock an upgraded version of Kirby: Squeak Squad‘s Magic ability. The other sub-game in Kirby 3D is Dedede’s Drum Dash, which is a fun mix of platformer and rhythm game. The idea of the game is to bounce along with Dedede to the end of the stage, only the platforms that line the way are drums. You’ll jump from drum to drum, avoiding enemies and collecting coins along the way. It’s a fairly easy game if you’re just going from start to finish, but it’s incredibly difficult if you want to get you a good score. 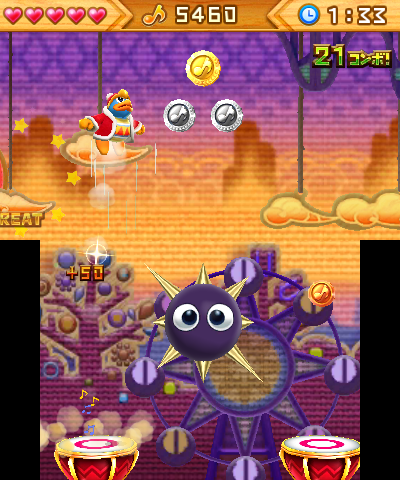 Dedede automatically bounces off each drum, to about the top of the bottom screen. Pressing A when you hit the drum will propel him higher, up to the top screen, and sequential jumps will go even higher, up to the very top. You have to time your bounces properly to follow the trail of coins and avoid the baddies, but it’s a lot more difficult than it looks, as you’re also trying to aim for the next drum. If you muck it up, Dedede will stumble, losing his jump power, and you’ll lose sync with the song. You also have to press A to bang a drum along with the backbeat at the height of each jump. Not only does this bump up your score, but it also keeps you aloft for a little longer, letting you pass over large enemies and clear wide gaps. This is where I have the most trouble, because my mind cannot fathom the idea of backbeat. I was stuck forever and gave up on Rhythm Heaven because as much as I tried, I could not pass the Lockstep game, which has you alternate tapping along to the beat and backbeat. It’s not quite so bad in Dedede’s Drum Dash though, because you have a visual cue (the apex of Dedede’s jump) to go along with the musical one. Getting it all together is tough, and takes a lot of practice, but I can already see the fruits of my labour growing. At first, my performance was atrocious, but now I’m doing okay. Earned a silver medal in the first stage, I did. Each level gives out two kinds of medals, too. The overall performance medal, from bronze through platinum, and then four special medals four each course. These special ones are for completing certain objectives, like clearing a stage quickly or collecting all the coins. Sadly, Dedede’s Drum Dash only has four stages, but mastering them will keep you busy for a very long time to come. It really helps that the game is incredibly fun and borders on addictive. It doesn’t seem like Nintendo has any plans for it, but these sub-games could benefit greatly from DLC add-ons. Since each stage is based around a song, Dedede’s Drum Dash seems like an obvious candidate for DLC stages. Some more beginner-level stages would be nice, too, as the current offering goes from “tough” to “maddening” pretty quickly. Extra DLC abilities would be the way to go for Kirby Fighters. Hell, maybe even a few new arenas or options like an item switch. I would readily pay a buck for an extra Dedede level or a couple new Fighters abilities. That’s an important point though: make it a buck. Plants Vs. Zombies 2 ensured that I’ll never buy any of it’s DLC by pricing it way too high. $3 for one plant? No way in Hell. Nuts to you, EA. At the end of the day, Kirby: Triple Deluxe is a wonderful package, made all the better by a couple of sub-games that are actually interesting. Both of them are fun and deep enough that they could be their own game. I mean, just look at how much I wrote about them alone! This was supposed to be a medium-length blog post, but it ended up being a whole article. And I hardly even did any senseless rambling! funny how things work out like that.